The great Ethiopian runner Tsegaye Kebede deliberated a masterful victory after timing his race to perfection to triumph in 2hr 6min 4sec with his country men standing third . Four miles before the finish, Kebede had been in fifth position and 49 seconds behind the leader but slowly he reeled in his opponents before overtaking Kenya’s Emmanuel Mutai in the last mile. It was a textbook example of how to remain patient and conserve energy until the business end of a marathon – one of the skills Farah admits he has to learn as he prepares to make his debut over the full 26.2-mile distance in London in a year’s time. 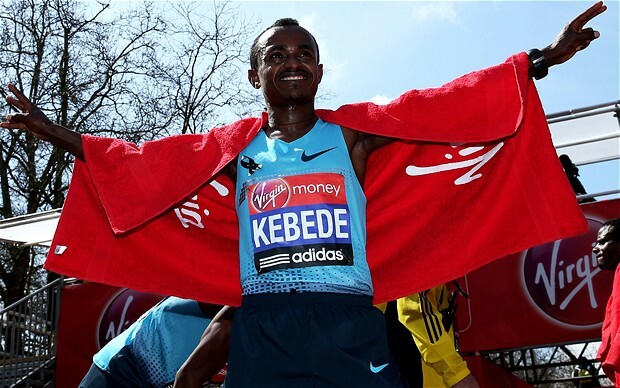 After all the predictions of a course record and possibly even a new world mark, Kebede’s winning time was actually the slowest in London since 2007 as the blisteringly fast pace-making clearly took its toll in the latter stages. The leading group had been exactly on world record pace at the halfway mark, shortly after Farah had exited stage left, and Patrick Makau’s world mark of 2hr 3min 38sec still looked feasible with eight miles remaining. But, with temperatures rising, all thoughts of records soon disappeared as a leading group of four runners broke away. Kebede, wisely, chose not to go with them. Kenya’s Stanley Biwott, a London Marathon debutant, was the first to attempt an attack at the 21-mile mark, though his surge lasted no more than a mile and a half when he was caught by Mutai. In one of the most exciting finishes in years, it was Mutai who was then overtaken as Kebede raced past him just after the 25-mile mark to claim his second London crown following his victory in 2010. Mutai was second in 2hr 6min 34sec, with Ethiopian Ayele Abshero third in 2hr 6min 57sec. u have to let the guys do their race. It’s their race. “Kenya’s Priscah Jeptoo was the runaway winner of the women’s race, though the outcome might have been different had Tiki Gelena, the Ethiopian who beat her to the Olympic gold medal last summer, not fallen heavily in an ugly incident before the 10-mile mark. Gelana, who was the quickest woman in the field, made the mistake of veering inside to grab a bottle at a drink station and ran straight across the path of wheelchair athlete Josh Cassidy, the 2010 London champion. n she dropped off the pace after 15 miles. She eventually finished 16th. aving to overtake the female runners en route.